Presentations take a long time to make. Particularly when I’m just conceptualizing my presentation, it takes a lot of work to record myself talking, use a tool to sync it with the proper visuals, and then repeat the recording and syncing process as I iterate on the content. I recently made a simple tool called Quickpreso to make the process of “prototyping” a presentation quicker, and more like writing a simple HTML page. This text will be spoken for slide one. This text will be spoken for slide two. The visuals can contain any HTML markup. Each section of voice-over text is rendered by the OS X say command; they’re all concatenated together into an audio file by ffmpeg. Finally, the visuals are synced to the audio in a Web page using popcorn.js. Quick iteration is facilitated by a simple Python web server that regenerates the audio file when it detects changes to the voice over text. The final product is all static content that can be served from any web server. 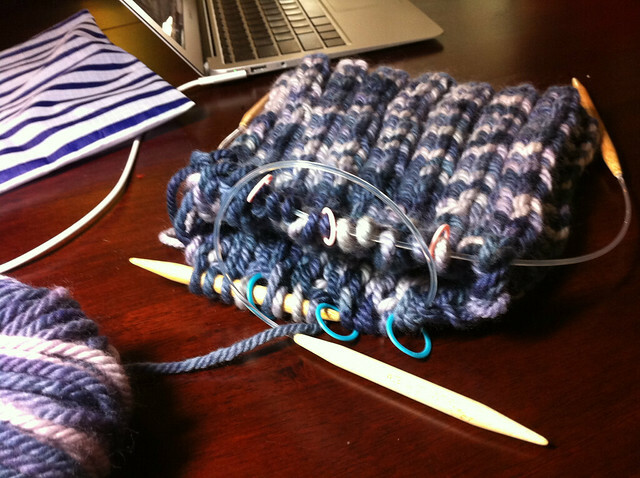 I used this tool to create a Webmaking for Knitters presentation in January. The result is quite robotic, obviously, though it can be made a little more natural-sounding if newer voices from OS X Lion are used (I’m still on Snow Leopard). One particular advantage of this approach, however, is that you get subtitles/closed-captioning for free. There’s also nothing preventing you from re-recording the final audio in your own voice once you’re happy with your prototype. The source code is available on Github at toolness/quickpreso. The code is in an alpha state, so your mileage may vary; fortunately, though, the source code is miniscule, so understanding and changing it shouldn’t be hard.